Somewhere between 1993 and now there seemed to grow a vocal group of Schindler-haters. This is not surprising, the more successful or acclaimed a movie gets the stronger the opinions of its detractors. Needless to say Steven Spielberg has never been fashionable within the cinema snob community (note: this is not an insult as I consider myself to have one foot in this circle), and it seemed as though the wet blanket collective quietly shut their mouths during the 1993-1994 Oscar campaign, only to raise their voices years later, when it ‘safe’ to deride the film. Perhaps this moment occurred with Roman Polanski’s “The Pianist” came out in 2002 – the Palme D’Or and Best Director Oscar winner, opened many people’s eyes to another ‘Holocaust’ movie (well, to be more accurate another Polish ghetto movie) which in the eyes of many of these deriders was better than Spielberg’s film. We don’t really talk about ‘Schindler’s List’ too much anymore. And so, happening upon ‘Schindler’s List” years later in high definition on television allowed me to revisit the film with a more discriminating eye than ever before. And what a stunner the film has continued to be. Is it ‘perfect’? No. I still don’t like the bookended present day scenes, the Jewish candle ceremony, nor the real life descendants visiting Schindler’s grave. Both scenes present an overly-sentimental tone inconsistent with most of the film. I say, ‘most’, because in those climactic moments Mr. Spielberg does let Liam Neeson go over the top in his regret for not saving enough Jews. But, save for these softer moments, it’s as tough and relentless a film as Spielberg has ever made. This time around I took specific note of Michael Kahn’s editing, which is phenomenal. For a three hour plus film he never lets the spectacle overshadow the smaller moments. Take the introduction of Schindler for instance, a series of quick close-ups (framed with the absolute precise lens size and composition) to elements of his attire telling us he’s an elegant man, a businessman, a capitalist preparing for battle if you will. And the execution of the hobnobbing Nazi party where he will secure his support of the Nazi’s for his latest money-making endeavour is equally masterful. Kahn channels some of the same editing pace used in “Lawrence of Arabia” and ‘Doctor Zhivago’, his transitions are sharp and abrupt. The introduction to the Krakow ghetto, the placement of the reception desk with all the appropriate documentation tools placed on the desk, then a remarkable cut from the precision of the administrator’s set-up to the chaotic mayhem of the Polish Jews being evicted from their home. At the time much was made of the disappearance of the Spielberg style within the reality of the story. I’d argue against that. Looking closely Spielberg’s familiar compositions are all over the film, though his may be handheld and less formal and locked down than his other serious films, Spielberg plays with all corners of the frame showing dynamic blocking and camera movement to manipulate the pace. Naysayers, snobs, wet blankets be damned, ‘Schindler’s List’ is a great film, some supreme filmmaking skill at work throughout all three hours and seventeen minutes of Schindler’s List which is impossible to dismiss. An impressive article and approach. Great job. Please note that Kingsley's acting performance. Nide article. Not just acting performance. Also note that cinematography and music. Really wonderful. Admittedly this is a half-review. Indeed I concentrated specifically on only a few of the film's qualities, or at least the ones that jumped out at me on this viewing. I could write another 500 words on the performances, and another 500 on the cinematography. Schindler's List is an exploitation movie. It's basically War of the Worlds. Many vocal people and intellectuals point out how evil the film is, but the masses are stupid. I agree it's a great film, and you're right to mention the editing. 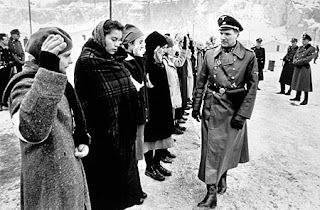 I also wrote an analysis of Schindler's List on my blog, just the other day. Thanks for the comment Alfred. Is that your real name by the way?